Abstract: The participant of this study was diagnosed with pineoblastoma – a malignant and rare form of brain cancer. She was in a coma in a hospital and no medication was able to help her. However, she recovered after taking herbs. In this ethnographic case study participant attributed her miraculous healing to God’s will and that God in His own ways had made available herbs for her recovery. Ever since then, her strong faith in God had kept her well. She was able to live a stress-free life and she remains well up to this day – five years after being discharged from hospital. CA Care, 5 Lebuhraya Gelugor, 11600 Penang, Malaysia. Copyright: This is an open-access journal and the reproduction of this article in any medium for educational purposes is allowed provided the original work is properly cited. The use of this article for commercial purposes, however, requires our prior permission. Pineoblastomas are primitive and highly malignant tumors exhibiting a fast tempo of progression of the disease [ 4, 5, 6 ]. Most malignant pineal region tumors have shown poor prognosis [ 7 ]. In Japan the overall survival of adults with pineoblastoma was 25.7 months [ 2 ]. Chang et al., [ 8 ] reported a median overall survival time of 30 months, from date of surgery. According to Tobias & Easton [ 1 ] the treatment results of high grade-tumors are too poor to justify routine intervention. They concluded that “as far as cure is concerned there is no use pretending that brain tumors are truly curable”. It is said that because of their highly invasive tendency, poorly defined borders and location, total gross resection of pineoblastomas is very difficult and can be outright dangerous. Although the effectiveness of external irradiation and chemotherapy has been reported, the overall outlook is extremely poor [ 9 ]. Role of Religiosity and Spirituality: More and more studies are supporting the idea that there is a positive correlation between religiosity and health and longevity [ 10, 11 ]. These findings are particularly strong in patients with severe and chronic illnesses, such as cancer [ 12 ]. Johnson & Spilka [ 13 ] reported that religion was an extremely important resource for the great majority of the women with breast cancer in their study. Prostrate cancer patients in British Columbia and Alberta, Canada, reported that spirituality had influenced the way in which they interpreted the meaning of their cancer diagnosis. Spirituality had transformed the meaning of a life-threatening diagnosis to a healing experience or journey in which cancer is a “teacher” or “messenger” [ 14 ]. Holt & McClure [ 15 ], who studied African Americans, reported that religion brought inner peace, calm or tranquility to their participants. The participants believed that God is always in control in all situations. It appears that religion has become a source of hope in time of need and illness, and having hope provides the impetus to continue their growth process in the midst of difficulties. In 1998, the participant, then 21 years old, presented with vomiting and headaches. A CT scan indicated obstructive hydrocephalus. Her condition returned to normalcy after doctors installed ventriculo-peritoneal (V-P) shunts. In March 2001, barely one and a half years later, the participant suffered a relapse. She went into a coma and had to be warded in the intensive care unit (ICU) of the hospital. There were tumors in her brain and she was diagnosed with pineoblastoma (Fig.1). Surgery could not be performed in the hospital. Doctors told her parents to find whatever “cures” they thought would help, since medicine would not be able to help her. A stranger told her parents about CA Care herbs. Two weeks after taking the herbs, the participant emerged from coma and was discharged from the hospital. In total, the participant was in the hospital for four months, from 30 March 2001 to 27 July 2001. She was in a coma for six weeks during which she was placed in the ICU. Her muscles were all stiff. Her skin peeled off like a moulting snake. The participant suffered total memory loss and had to learn how to read and do the basic household chores all over again. She took almost a year to regain her health. The participant remains well for more than five years now. Since her discharge from the hospital she did not receive any medical attention. She only took herbs. In June 2006, the participant suffered pain in her eyes and had blurred and multiple visions. Her problems were resolved after taking more herbs. Figure 1: Images of participant’s brain in 2001, leading to a diagnosis of pineoblastoma. Our interview with the participant conducted in July 2006 was based on a “willingness-to-share basis”. In early 2006, we requested the participant to answer a questionnaire that consists of two parts. Part 1 concerned coping strategies using the Brief COPE [ 16 ], a 28-item inventory. The instrument comprises two items of each of the 14 coping strategies: self distraction (α = .23), active coping (α = .72), denial (α = .59), substance abuse (α = .73), use of emotional support (α = .81), use of instrumental support (α = .82), behavioral disengagement (α = .60), venting (α = .46), positive reframing (α = .70), planning (α = .69), humor (α = .79), acceptance (α = .50), religion (α = .77) and self-blame (α = .67). Patients answered ratings which asked how often they employed a particular coping strategy regarding their cancer experience (1= I haven’t been doing this at all, 4 = I’ve been doing this a lot). 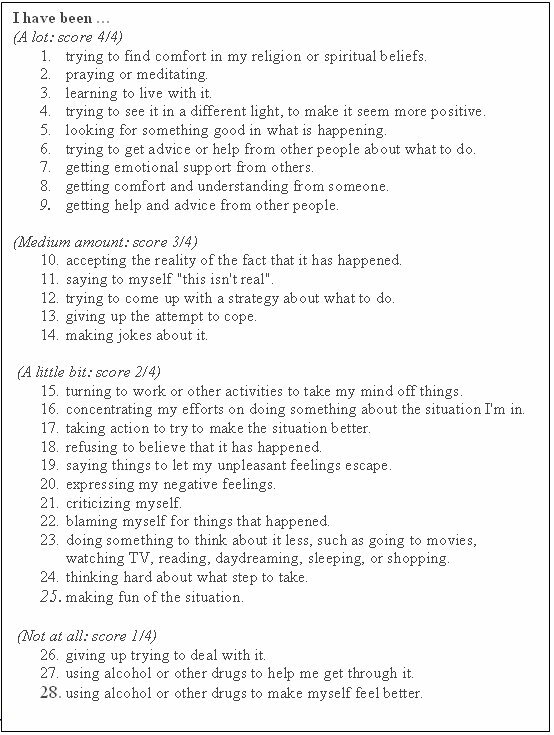 Part 2 of the questionnaire measures post-traumatic growth using the Post-traumatic Growth Index [ 17 ], a 21-item inventory that measures the positive changes that an individual experiences after a traumatic event. The instrument comprises of 5 factors that determine the major domains of post-traumatic growth: relating to others better (7 items with α = .87), recognizing new possibilities (5 items with α = .90), a greater sense of personal strength (4 items with α = .86), spiritual change (2 items with α = .68) and greater appreciation of life (3 items with α = .77). Patients answered ratings which asked the extent of change cancer has brought to their life (0= I did not experience this change as a result of my experience with cancer, 5= I experienced this change to a very great degree as a result of my experience with cancer). 28 were scored lowest reflecting that the participant did not give up trying to deal with the problem or worse still turned to alcohol or drug to so solve her problem. Table 1: Coping strategies adopted by the participant. When asked if her cancer experience had brought any positive outcomes to her life, the participant gave maximum score of 5 to the first five answers (Table 2). Answers 1 & 2 relate to spiritual growth. Answer 3 concerns relationship with others knowing that she can count on people in time of trouble. Answer 4 indicates her awareness and appreciation for each day that she is alive. The experience with cancer has also led the participant to have more compassion for others. The participant faced three health episodes in her life. The first episode was when she suffered hydocephalus and needed installation of V-P shunts in her brain. After the surgery she did not suffer any distress. She thought everything was alright and in her own words believed that “the world was still in my hand”. If we believe that an illness is a warning sign that something has gone wrong and that we need to change our ways, then this first episode has failed to obtain its objective. The participant went about her routine as before, not realizing that something more serious has yet to happen. The participant’s second health episode resulted in her being in a coma. No one around her – doctors, parents and friends, ever believed that she would recover from her brain cancer. The participant’s recovery was beyond comprehension. Religious people would call it a miracle, but modern medicine would call it spontaneous healing. In a magazine article (mentioned earlier) entitled, “From a judo expert to being a servant of God”, the participant wrote: “ I was destined to consume Dr. Teo’s herbs. This man was used by God to heal me. And I believe God will continue to heal me with time”. The participant’s perception of God’s healing is consistent with Christian belief. In a survey among 1052 households in eastern North Carolina, Mansfield et al. [ 18 ] found that 80% of respondents believe God acts through physicians to cure illnesses. A study of residents of two rural North Carolina counties also revealed that participants believe that doctors get their ability to heal from God [ 19 ]. Various studies have shown many positive outcomes and beliefs regarding religiosity and spirituality and health. Men with prostate cancer in Canada did not perceive their cancer as a threat or an invading force but rather a companion in their life’s journey: to cooperate and engage [ 14 ]. Spirituality had helped them transform their cancer experience into something meaningful which resulted in many positive changes in their lives besides softening the emotional impact of the cancer diagnosis. Interviews with African American by Holt & McClure [ 15 revealed that participants rejected the notion that God causes illness or God sends illness. The idea that illness is a punishment from God is also rejected. On the other hand, sickness is considered as a “message”, or an early warning sign that something has gone wrong with our lives. The way participants coped with life-threatening events is to give their problems up to God or in others words, putting them in God’s hand. Another study in rural North Carolina showed that the participants believed that God is ever in control and as such by having faith in God, through prayers, studying the Bible, attending church services, they maintain their relationship with God. This made them feel better both mentally and spiritually if not physically. Religion then becomes a source of hope. One significant point about their religious practice is that they do not see themselves as “using” their religion. Their religious faith and practices have become integral parts of their lives and their religious expressions – whether church attendance or Bible reading or prayer are an outgrowth of their love of God and their faith in Him [ 19 . The interview with this participant revealed that she too had the same perceptions as mentioned above about her life after her recovery from brain cancer. Her first action was to acknowledge her gratitude to God and she changed her life’s priority. She decided to go to the seminary preparing to devote her entire life as God’s servant. The participant said, “I believe God is in control. My life now is not for me. I live my life for God. God will take care of everything”. By this, the participant has placed all her faith in God. This attitude might appear fatalistic or passive but this is not so. Accepting the reality that she had cancer, the participant also engaged in active coping strategies (Table 1). By trusting God and asking God to take care of the rest, the participant lived a life devoid of worry and stress. However, each month when she suffered headaches, she was reminded of her vulnerability wondering if the cancer had recurred. But even then, she sought reassurance from God through her prayers ending with a humble submission that “let Thy will be done”. During our interview with the participant, we did not detect any distress in her. This is a young lady who has given her life to God and has a strong belief that God is in control and that everything that happened has to happen according to God’s plan. The participant said: “In my life, I place this relationship – God, myself and others in that order. All of them played significant roles in helping me cope with my current situation”. This story brings out some significant messages to us too, as a provider of non-medical therapy for cancer patients. We have learned through “miraculous” healing such as this that God works in different ways that men often find it hard to understand or explain. Over the years that we have help cancer patients, we have encountered many cases of such healings. These events have left us in great awe of the Almighty Healer. As such, the motto of our organization is, “Our hands, but God heals”. This is the message we impart to all patients who come to us for help. He works in ways we cannot see, He will make a way for me. With love and strength, He will make a way for me. Medical science often discounts the contribution and impact of religion and spirituality on the healing of illnesses. Social researchers on the other hand treated religion / spirituality as one of the coping tools that patients use to overcome distress. They look at religious coping as involving the same psychological processes as other human activities [ 10. That being so, the next logical step to take in research is to find the mechanism by which religion / spirituality exerts its effects. By understanding the mechanism, the “active ingredient (a.i. )” by which religion / spirituality promotes health can be established. It may then be possible to “prescribe” this “a.i.” to all people, even to those unwilling to participate in religion and still hope to reap the benefits that religiosity provides [ 11 ]. This suggestion parallels what is happening in the field of natural science. Bioscientists would always attempt to isolate the “active ingredients” of medical plants or herbs. Once this a.i. is identified, it can be synthesized in the laboratory and ultimately the compound formulated into “pills” for the use of the general public. However, we have to keep in mind that although at times they succeeded, at times they failed too. Sometimes their efforts bring benefits but more often than not, their efforts create more problems and do more harm. This is because we may be able to characterize and isolate the physical aspects of the bioactive compound but it is impossible to “capture the wisdom” found in each herb. Fitzgerald [ 20 wrote, “Western medicine’s obsession with magic bullets, attempting to isolate single active molecules as healing triggers, misses an entire range of extraordinary therapeutic gifts available in nature … modern chemistry and technology can only supplement – not replace – the wisdom of nature”. James Jones [ 10 had rightly pointed out that although religion involves ordinary psychological processes such as attribution, motivations, social relationships and cognition that can be studied, there is, however, a unique dimension of religion that eludes human understanding, just like the herbs.